The switch will see the replacement of the trivalent oral poliovirus vaccine (tOPV) with bivalent oral poliovirus vaccine (bOPV). 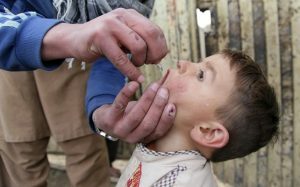 A child is vaccinated with an oral poliovirus vaccine. Between 17 April and 1 May, approximately 150 countries will switch from the trivalent oral poliovirus vaccine (tOPV) to bivalent oral poliovirus vaccine (bOPV). This represents the largest withdrawal of one vaccine, and associated roll out of another vaccine in history. Polio is a debilitating and crippling disease, which can result in incurable, lifelong paralysis. The extensive use of trivalent OPV around the world has been largely responsible for reducing the number of cases of wild poliovirus from over 350,000 in 1988 to just 74 in 2015. In the same period, the number of countries endemic to polio has decreased from 125 to just 2. Now only Afghanistan and Pakistan remain endemic to wild poliovirus. If tOPV has been so successful in reducing paralysis, why is it being withdrawn? While many people believe that polio is a single disease, it can actually be caused by three very closely related viruses, types 1, 2 and 3. Immunity against one serotype of poliovirus does not induce immunity against the other types of virus. In September 2015, the Global Commission for the Certification of Eradication of Poliomyelitis confirmed the eradication of wild poliovirus type 2, the last case of which was recorded in India in 1999, and has not been detected in humans or in the environment since. The trivalent oral polio vaccine contains live, attenuated (weakened) virus of all three serotypes, and is administered orally. The virus is able to replicate in the gut, during which time the individual is able to mount an immune response. In exceptionally rare circumstances, if too few people in a community are vaccinated, the vaccine-virus may begin to circulate, and if continued uninterrupted over many months, the vaccine-virus may reacquire neurovirulence, and cause cases of paralysis. This is known as a circulating vaccine-derived poliovirus (cVDPV). However, if enough people are vaccinated during immunization the vaccine-virus will die out before it is able to revert to a neurovirulent form. As such, cVDPVs are not a problem of the vaccine – they only occur in communities in which coverage is low. The risks of cVDPVs are well known and accepted. 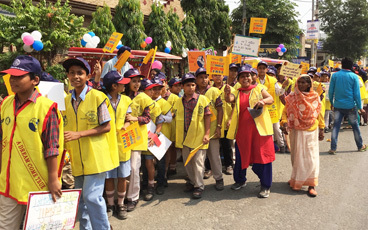 In the last 10 years, vaccination against poliovirus has averted more than 5 million cases of paralysis. In the same period, only 725 individuals have been paralysed by a cVDPV. While the wild poliovirus type 2 has been eradicated, it is the type 2 component in tOPV – now essentially redundant – which has been responsible for more than 90% of the cVDPV cases in the last ten years. However, while tOPV is still in use, there is the continued risk of reintroduction of cVDPVs. As such, polio can only be eradicated if all OPV is eventually withdrawn. The withdrawal of the type 2 component in April 2016 is the first stage of this withdrawal. Why does the switch have to be synchronised around the world? Use of trivalent OPV after the switch could jeopardize polio eradication by generating type 2 cVDPVs. The switch must be globally synchronised to ensure that no country is put at risk of importing a type 2 cVDPV from another country that continues to use tOPV. The same reasoning holds for why countries are advised not to switch before April 2016, as use of bOPV while tOPV is still being used would put the country at risk. With the globally synchronised cessation, the type 2 vaccine-virus in the environment should die out before a new birth cohort introduces new susceptible individuals for the virus to persist within. A stockpile of monovalent oral polio vaccine type 2 (mOPV2) which only contains attenuated type 2 virus will be mobilised in the event of any cVDPV type 2 outbreak, that started circulating prior to OPV2 cessation. Wild poliovirus type 3 has not been detected in the wild since 2012, raising hopes that this serotype has also been eradicated. Following the interruption of transmission of wild poliovirus type 1, the program will eventually withdraw the bivalent oral poliovirus vaccine. In the future, the inactivated poliovirus vaccine (IPV), which does not pose any risk of generating cVDPVs, will be used in place of OPV. Laboratory and research facilities must ensure any potential sources of poliovirus are contained to prevent accidental release into the environment. The polio programme will transition the infrastructure developed and lessons learned to contribute to broader health outcomes. If progress is maintained, poliovirus can be the second-ever human disease in history to have been eradicated. This will represent a remarkable achievement and will protect all future generations from the devastating effects of poliovirus.